Using state-of-the-art, switch-mode technology, IOTA Power Converter/Battery Chargers are engineered with the user and variable environmental conditions in mind. Extra care has been given to insure many years of service-free operation, even when subjected to extremely harsh conditions. 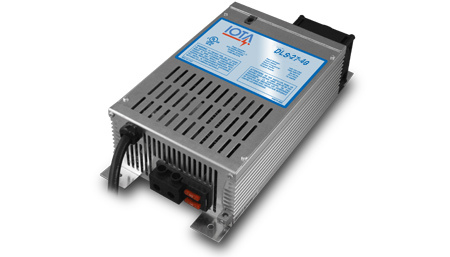 DLS multi-stage chargers ensure that deep cycle batteries are charged quickly and efficiently without over-charging, and pumps, motors, and fans operate perfectly for prolonged life. Approximate Dimensions 9.7" x 6.7" x 3.4" 9.7" x 6.7" x 3.4" 13" x 6.5" x 3.4"